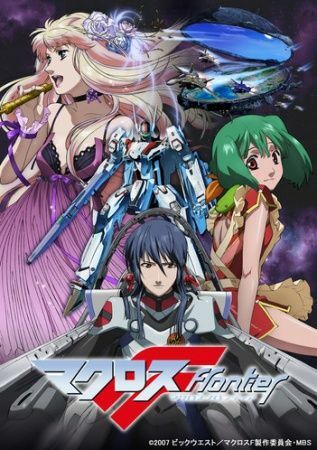 Following a catastrophic war against a race of giants known as the Zentradi, humanity has escaped towards the center of the galaxy aboard a fleet of colonial vessels called the Macross Frontier. As the extraterrestrial threat is left further and further behind, life on Macross Frontier proceeds as usual. In the year 2059, a young mecha pilot trainee named Alto Saotome and his colleagues are preparing to perform an accompanying routine for the famous singer Sheryl Nome, who has come to Macross Frontier for a concert. During the performance, a biomechanical alien species known as the Vajra make a sudden appearance, breaking through the defensive perimeter surrounding the vessel and crash-landing near the concert venue, plunging the entire city into chaos. As the concertgoers evacuate, a young girl named Ranka Lee is left behind and gets targeted by the Vajra, but she is saved at the last minute by Alto. Following these events, the Strategic Military Services program notes Alto's skill in battle, resulting in his recruitment to combat the new alien threat.